Germany’s anti-Muslim sentiment: The attack on Charlie Hebdo will raise far right anger across Europe. 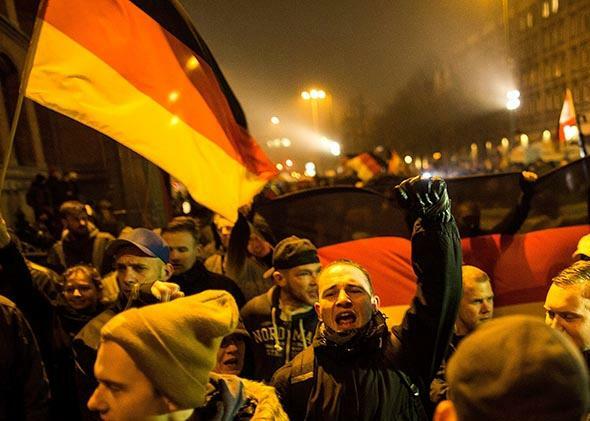 Anti-Muslim sentiment in Germany was already roiling. The Paris terrorist attack will make it much worse. Supporters of the Pegida movement gather for a march in their first Berlin demonstration on Jan. 5, 2015, in Berlin. BERLIN—While the attack on Charlie Hebdo sent shockwaves around the world, in Germany the news couldn’t have come at a worse moment. Presiding over the second-largest Muslim population in Western Europe, after France, Chancellor Angela Merkel has been trying to stamp out a populist uprising in the country’s east that is demanding an end to the “Islamization” of the West. “We have a very good relationship with the over-overwhelming majority of Muslims in Germany,” Merkel said Thursday, adding an extra over for emphasis. Just a week earlier, in her New Year’s address, Merkel had given some motherly advice to her fellow citizens, telling them to stay away from growing rallies in Dresden organized by a group called PEGIDA, short for Patriotic Europeans Against the Islamization of the Occident. The German establishment, which prides itself on decades of political consensus and social peace, finds itself in an uncomfortable spot. While politicians from all the main parties call for tolerance and calm, an increasing number of Germans see a gap between themselves and their elected officials, especially on hot-button issues like immigration. Even as German media portray the PEGIDA protests as a regional phenomenon among frustrated provincials from the former East Germany, the demonstrations reflect a deeper unease about immigration nationwide. As coincidence would have it, the private Bertelsmann Stiftung published an in-depth study on Muslims in Germany the day after the Charlie Hebdo massacre. The group found that while the vast majority of the country’s 4 million Muslims identify with German democracy, the population at large regards them with suspicion. According to the study, 57 percent of Germany’s non-Muslims view Islam as a threat, and 61 percent of Germans don’t believe Islam is compatible with life in the West, up from 52 percent in 2012. What’s more, 40 percent of respondents said they feel like strangers in their own country, with one in four supporting a ban on Muslim immigrants. Germans have only reluctantly accepted that their country has become a de facto destination for immigrants—and even depends on them to support an aging population. Beginning in the 1960s, capitalist West Germany filled its post-World War II labor shortage with “guest workers” from Turkey and Southern Europe. East Germany, though it hosted “contract workers” from fellow communist countries such as Vietnam and Angola, was largely spared the challenges of multiculturalism. After German reunification in 1990, some of the most horrendous attacks against foreigners took place in the eastern part of the country. The Bertelsmann study concluded that Germans’ negative attitudes toward Islam cut across income, educational level, and political lines. At the same time, the study found that older people feel more threatened than younger ones, and that Islamophobia is greatest where there are the fewest Muslims. In the state of North Rhine-Westphalia, where one-third of Germany’s Muslims live, 46 percent of the population perceive a threat, while in Saxony—where PEGIDA was born and less than 0.1 percent of the population is Muslim—70 percent do. Of course discomfort about Muslims is not limited to Germany. Dutch politician Pim Fortuyn, who openly criticized Islam, was assassinated in 2002, and in Switzerland a 2009 referendum led to a constitutional ban on the construction of minarets. More recently, a string of arson attacks on mosques has jarred Sweden. In Germany, however, where the political order has been shaped by the memory of Nazi excesses, politicians can’t always express what their voters are thinking. Slowly but surely, taboos are being broken. In 2010, Thilo Sarrazin, a former Social Democratic finance minister of Berlin, became an embarrassment to his political party and a hero to millions of Germans when he published the best-seller Deutschland schafft sich ab (“Germany is getting rid of itself”), in which he identified immigration from Muslim countries as one of the main factors leading to the country’s self-destruction. (Interestingly, Sarrazin’s name derives from Saracen, a designation for Muslims during the Middle Ages.) A later book by Sarrazin pilloried the euro. The upstart party Alternative for Germany, or AfD, hammered away against the common European currency as it burst onto the political scene in 2013. The party criticizes Merkel for having moved too far to the center, appropriating traditionally left-wing issues such as liberalized immigration, environmentalism, and gay rights. Its target audience is not only protest voters but upstanding citizens—doctors, lawyers, businesspeople—who have lost their political home. Represented in three eastern German regional parliaments, the AfD is now focusing on immigration as it seeks to widen its influence. On Wednesday, Alexander Gauland, a party leader, said that immigrants should be let in based on cultural compatibility and not just economic grounds. Following the Charlie Hebdo attack, Gauland laid it on even thicker: “All those who ignored or mocked the concerns of many people about a growing danger from Islamism have been punished by this bloody crime.” That evening the AfD caucus in the Saxon Legislature held its first talks with PEGIDA representatives. The mayhem caused by the Charlie Hebdo attackers comes amid headlines about Islamist violence—ISIS, Boko Haram, al-Shabab—and the boatloads of people fleeing it arriving on Europe’s shores. On Thursday two Islamists from Germany went on trial, charged with joining a terrorist organization in Syria. One of the defendants, a 36-year-old identified as Fatih K., was born in Berlin to Turkish parents; the other one, Fatih I., 27, is a Turkish citizen from Frankfurt. Germany’s Central Council of Muslims, which condemned the Paris massacre in the sharpest of terms, is calling for a vigil for “openness and tolerance” at the Brandenburg Gate on Monday. Sigmar Gabriel, the head of the Social Democrats, is reportedly trying to mobilize Germany’s other major faiths, parties, and unions to join the demonstration as a sign of solidarity against intolerance and terror. The date wasn’t chosen by chance. PEGIDA is calling for its 12th demonstration against Islamization on the same evening.